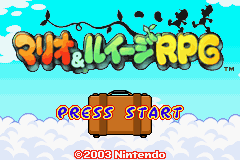 The Japanese version was released on 11/21/2003, just four days after the U.S. version. Since the game was developed in Japan, we will show the Japanese screens first. 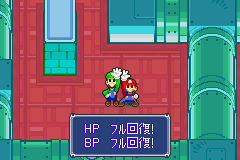 Even if you can't read Japanese, it's pretty obvious that the Japanese title is "Mario & Luigi RPG." 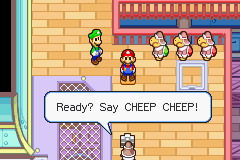 Nintendo of America's penchant for subtitles shines bright in the English title. 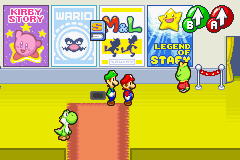 Part of the neat little silhouette design on the Japanese title screen appears on a poster in Yoshi Theater. The poster is the same in all versions of the game. 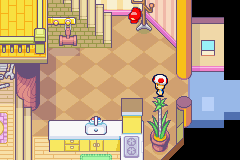 After Toad runs into the brothers' house to find Mario, a Directional Pad pops up in the bottom left in the Japanese version when Toad is done talking. Perhaps they were trying to avoid the "Oh, I'm supposed to play now?" moments. 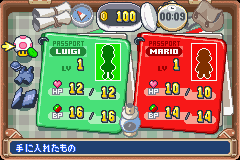 In the Japanese version, Mario and Luigi start out with 4 and 6 more BP, respectively. The brothers have a short sound clip when switching between the two in the equipment and stats screens. 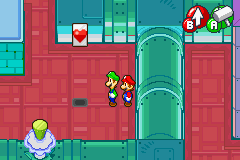 Luigi's "Ya-hoh!" 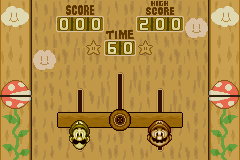 in the U.S. version is a grunt-like "rrnnnng" sound in the Japanese game. When the brothers get their passport photos taken on the Koopa Cruiser, the photographer tells them to "Say CHEEP CHEEP!" 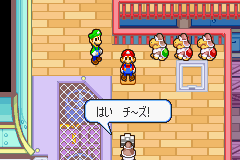 In the Japanese version, the line is "Say cheese!" 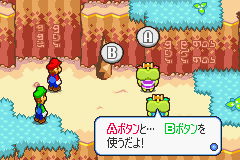 Upon leveling up in the Japanese game, players are treated to helpful tips from Lakitu. 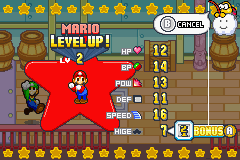 First, Lakitu shows us that pressing Up or Down selects a stat to upgrade. 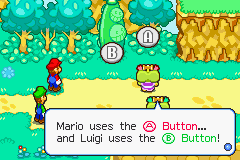 Then, just in case you change your mind, he tells us that the B button cancels the selection. 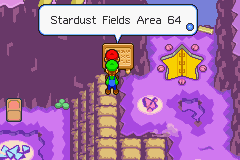 The section of Stardust Fields where the Mario Bros. meet the Starshade Bros. is called "Area 64" in the U.S. version and "Area 51" in the Japanese version. "Area 51," also known as Groom Lake, is a military facility located in Nevada. 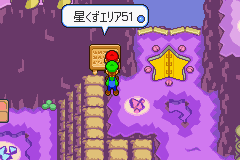 The "64" is an obvious reference to the Nintendo 64. 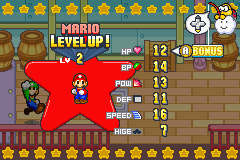 In the Japanese version, a block that fully restores the brothers' HP and BP exists in a few different areas. 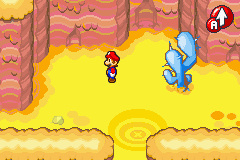 One is in the first room of the Beanbean Castle Sewers, another is in Oho Oasis, and yet another is found during the final visit to Teehee Valley. 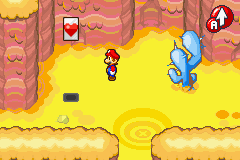 When hit, it turns into a heart before disappearing, and then re-appears after displaying a message. This block is free to use and never goes away. This message appears after you hit the block. Translation: "HP fully restored! BP fully restored!" 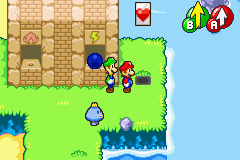 According to your Beanbean map, the Hammerhead Bros.'s hammer tutorial takes place in Hoohoo Mountain, but the U.S. version uses a Beanbean castle grounds background. You can also see the different button icon styles used in the dialog boxes. 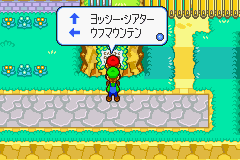 The sign located directly north of Beanbean Castle Town is different in each version. 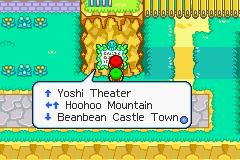 The Japanese sign does not point you to Beanbean Castle Town, and it only has one arrow for Hoohoo Mountain. Also obvious here is the arrow size difference. 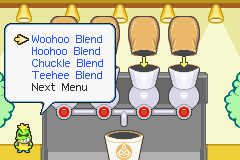 Bubbles's plays on words from the Japanese game wouldn't make much sense in English, so the U.S. version has a different set of jokes for him. They did manage to put pig, drawer, and horse jokes in both versions, however. The first three jokes listed for each version are told before the battle with Chuckolator. "What do idiots drink? So-duhhhh!" "What do sodas call their dads? Pop!" "A hippie's favorite soda? Granola cola!" "Funny pigs are real hams!" "What do sheep count to sleep?" 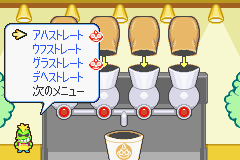 On the bean blending menu at Starbeans Cafe, the Japanese version puts red E. Gadd icons next to the drinks you've already made. There's no indication of previously-made drinks in the U.S. version. Trunkle can magically heal his head-tree in the Japanese version! If his head has over 1 HP of damage, he will restore anywhere from 40 to 47 HP right after you attack it. Trunkle's vacuum attack brings Gritty Goombas, mushrooms, and poisonous mushrooms in from the left side of the screen. 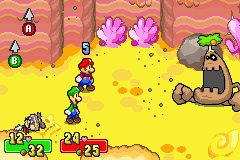 The white mushrooms restore 8 HP to Mario or Luigi in the Japanese version and 5 HP in the U.S. version. When his vacuum attack is over, Trunkle heals his body. 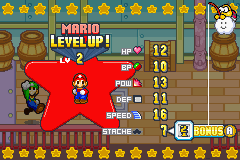 In the U.S. version, he restores 10 HP after each vacuum attack. 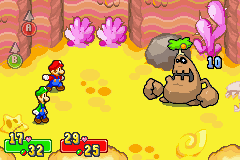 He heals a bit more in the Japanese version, because the amount he restores is based on what he swallowed; he restores 4 HP per Gritty Goomba, 8 HP per mushroom, and 2 HP per poisonous shroom. 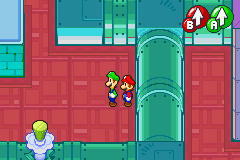 Mario and Luigi's heads look more 3-D in the U.S. version of Star 'Stache Smash. 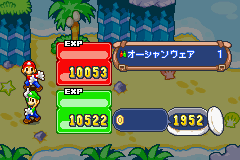 "Ocean Wear" is dropped by Boomerang Bros. in the Japanese game only. The only way to get this armor in the U.S. version is by using cheat devices. Its English name is "Oho Gear," as seen in Nintendo Power's Superstar Saga player's guide, along with other unused armor. 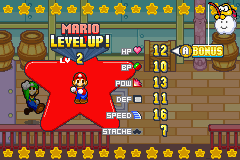 Some armor and badges are dropped by different enemies in each version. The following table shows the enemies affected by the changes listed above. Trunkle Lucky Bros., Super Nut N/A 1-Up Mushroom Lucky Bros. The only enemies who have the same stats in both versions are Bill Blaster, Boomerang Bro, Dry Bones (Hoohoo Mountain), Fighter Fly, Goomba, Oho Jee, and Rex. 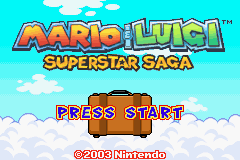 Please refer to our Superstar Saga guide for a complete comparison. Oucher Glass: "Sunado K" is a play on sunadokei (hourglass). Most of the items that recover a set amount of HP or BP were changed. The following table separates the items into two groups: Those you can buy from shops, and those you cannot. Also included are Coin values for buying or selling. The following table separates the armor into two groups: Those you can buy from shops, and those you cannot. Also included are Coin values for buying or selling. The "For" column shows who can wear the armor. 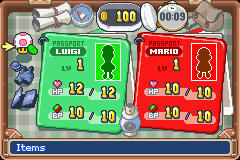 "M" = Mario, "L" = Luigi, "ML" = both. There are four "wearability" changes. *You can only get Oho Gear in the U.S. version by using cheat devices. Its stats are included for comparison purposes only. The following table separates the badges into two groups: Those you can buy from shops, and those you cannot. Also included are Coin values for buying or selling. スプラッシュブロス Supurasshu Burosu Splash Bros. Splash Bros.
スイングブロス Suingu Burosu Swing Bros. Swing Bros.
チョッパーブロス Choppā Burosu Chopper Bros. Chopper Bros.
ファイアーブロス Faiā Burosu Fire Bros. Fire Bros.
バウンドブロス Baundo Burosu Bounce Bros. 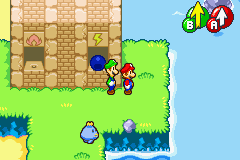 Bounce Bros.
ノックバックブロス Nokkubakku Burosu Knockback Bros. Knockback Bros.
タイフーンブロス Taifūn Burosu Cyclone Bros. Cyclone Bros.
サンダーブロス Sandā Burosu Thunder Bros. Thunder Bros.